All the best techniques for completing a wide variety of projects. How to select and apply finishes, which tools to use to achieve desired effects, how to color wood, and how to repair damaged finishes. 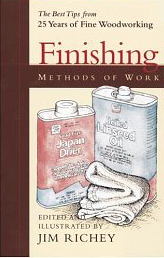 The best tips from the "Methods of Work" column in Fine Woodworking over the past 25 years.